F Lukáš Vantuch (Calgary, Lethbridge, 2005-07) has been loaned by Liberec to Hradec Králové (both Czech Republic, Extraliga) for the rest of this season. He had been an injury replacement with Landshut (Germany, DEL2) earlier this season, earning three assists in six games. He was released on Oct. 21. . . .
D Ty Wishart (Prince George, Moose Jaw, 2004-08) has signed a contract for the rest of the season with Mora (Sweden, Allsvenskan). This season, with the Evansville Icemen (ECHL), he had one goal and one assist in 14 games. He was a teammate with the NY Islanders and Bridgeport (AHL) with Mora head coach Jeremy Colliton (Prince Albert, 2001-05). The Moose Jaw Warriors will retire No. 28 in honour of F Ryan Smyth (1992-95) on Feb. 6. A second-round selection by the Warriors in the 1991 bantam draft, he totalled 224 points, 110 of them goals, in 188 regular-season games with the Warriors. . . . The Warriors also have retired numbers worn by Kelly Buchberger (24), Mike Keane (25) and Theo Fleury (9). . . . According to a news release, “His best season was 1993-94, in 72 games he had 50 goals and 105 points. He is one of 10 players in Warriors history to score 50 goals in a season, and one of 13 players to record 100 or more points in a season.” . . . The Edmonton Oilers selected Smyth with the sixth pick of the NHL’s 1994 draft. He played 1,270 NHL games, with the Oilers, New York Islanders, Colorado Avalanche and Los Angeles Kings. He also is known as Captain Canada for having played 90 games for various national teams. 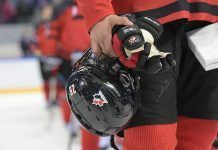 According to the news release, Smyth “is the only player in hockey history to win gold at the Olympics, World Cup, World Championships, World Juniors, and Spengler Cup.” . . .
Nick Patterson of the Everett Herald reports that Everett Silvertips F Nikita Scherbak is day-to-day with a “deep thigh bruise.” Scherback was taken from the ice in Kent, Wash., on a stretcher on Saturday night, during a game in which Everett beat the Seattle Thunderbirds 3-2 in a shootout. . . . Scherbak has 28 points, including 11 goals, in 19 games, but he won’t play tonight against the visiting Kamloops Blazers. F Marcus Messier, 20, has joined the AJHL’s Drumheller Dragons, and has three points, including two goals, in three games going into Tuesday action. Messier left the Prince Albert Raiders on Nov. 8, citing “personal family matters.” He was placed on WHL waivers on Nov. 13. . . . Tip of the fedora to Tyler King, the radio voice of the AJHL’s Fort McMurray Oil Barons, for the info. Elliotte Friedman of Sportsnet has split his weekly 30 Thoughts into two pieces this time. . . . He opens right here with a terrific piece on memories of Pat Quinn and Victor Tikhonov. . . . Friedman follows up with his 30 Thoughts right here. Purely for your reading enjoyment, right here is a piece written by Jef Lund for Rolling Stone. The headline says it all: The 15 Worst Owners in Sports. . . . Note that this one comes with a language warning. 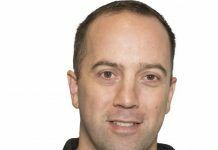 F Carter Folk of the Lethbridge Hurricanes drew a three-game suspension under supplemental discipline for an incident in a game against the host Kootenay Ice on Friday night. D Dylan Overdyk was injured on the play and is out indefinitely. . . .
F Matthew Campese of the Kamloops Blazers was suspended for two games for a knee-on-knee hit on F Chase Witala of the Prince George Cougars on Friday night. Witala left the game and didn’t return, nor did he play Saturday in Vancouver. 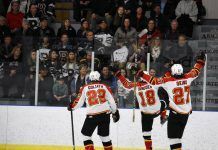 He is shown on the injury report as day-to-day. . . .
F Aaron Macklin of the Prince George Cougars and F Dakota Odgers of the Vancouver Giants scrapped off the opening faceoff in Vancouver on Saturday. . . Macklin drew a two-game suspension for his second such fight of the season; Odgers got a one-game suspension. . . . Vancouver drew a $250 fine for the fight, while Prince George was hit with a $500 fine. . . .
F Chase Lang of the Calgary Hitmen drew a one-game suspension after taking a cross-checking major and game misconduct during a Sunday game in Red Deer. . . . 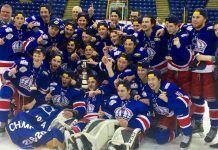 The Edmonton Oil Kings have been fined $250 for a warmup violation in Brandon on Saturday night. Yes, the WHL’s Christmas shopping fund is rounding nicely into shape. The Kelowna Rockets, who played on the weekend with 16 skaters, two under the maximum, have added F Jordan Bortsmayer and F Kole Lind, at least for the short term. . . . 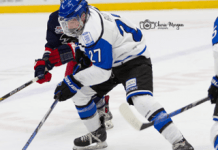 Both player for the midget AAA Saskatchewan Contacts. . . . Bortsmayer was a third-round pick in the 2013 bantam draft, while Lind went in the fourth round. 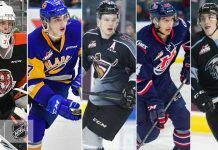 Lind has 34 points, including 21 goals, in 20 games; Bortsmayer has nine assists in 20 games. . . .
F David Soltes of the Prince George Cougars will play for his native Slovakia at the World Junior Championship in Toronto and Montreal, Dec. 26 through Jan. 5. . . . Soltes has 11 points, including eight goals, in 20 games in his sophomore season. Last season, a knee injury limited him to only 14 games with the Cougars. . . . He is scheduled to leave the Cougars on Dec. 11. . . . In Brandon, F Brett Stovin scored at 1:35 of OT to give the Saskatoon Blades a 5-4 victory over the Wheat Kings. . . . Stovin, who was foiled by G Jordan Papirny on a first-period penalty shot, has four goals this season. . . . The Blades took a 4-2 third-period lead on goals by F Nikita Soshnin, his second, at 13:52, and D Ryan Coghlan, his first, at 15:38. . . . 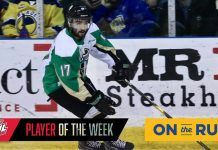 The Blades traded F Cory Millette to the Prince Albert Raiders last week at least in part to free up playing time for Soshnin, who has goals in two straight games. . . . Brandon F Tim McGauled forced OT with his 12th goal at 19:50. . . Brandon F Reid Duke had a goal, his seventh, and two assists. . . . Saskatoon G Trevor Martin stopped 40 shots, while Nik Amundrud was dressed as the backup. . . . Brandon was 1-for-2 on the PP; the Blades’ PP unit didn’t get even one opportunity. . . . The Wheat Kings (19-5-2) had won their previous two games, while the Blades (7-16-1) came in 0-3-1 in their previous four. . . . The teams will meet again Friday, this time in Saskatoon. . . . Before then, though, the Blades will entertain the Moose Jaw Warriors tonight. . . . 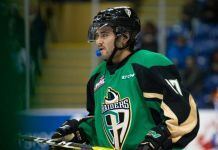 In Edmonton, the Prince Albert Raiders scored three second-period goals en route to a 4-3 victory over the Oil Kings. . . . The Raiders have won five straight regular-season games in Edmonton. . . . F Jayden Hart, with his 13th, D Sawyer Lange (6) and F Simon Stransky (3) scored for the visitors as they erased a 1-0 deficit and took a 3-2 lead into the third period. . . . F Matteo Gennaro, with his third, gave the Raiders a 4-2 lead at 16:12 of the third period. . . . Edmonton F Lane Bauer scored his ninth at 18:39. . . . Edmonton D Ashton Sautner tied a career high with his eighth goal of the season, running his point streak to seven games in the process. . . . F Reid Gardner had two assists for the Raiders, who got 23 saves from G Rylan Parenteau. He won for the sixth time in seven starts as the Raiders (12-13-0) ran their winning streak to four. The Raiders are 5-4-0 under head coach Marc Habscheid. . . . G Patrick Dea turned aside 36 shots for the Oil Kings, as Tristan Jarry (ill) sat out for a second straight game. . . . “We were a train wreck in our own end,” Edmonton head coach Steve Hamilton said on the team’s website. “Our D-zone, it was maybe the softest we’ve been in our own end all (season). If our guys choose to forget this one, then they’re missing the boat. They need to remember this because we were brutal in our own end.” . . . Edmonton had been 5-0-1 in its previous six home games. . . . The Oil Kings (12-10-4) now have lost three in a row (1-1-1). . . . The Oil Kings are at home to the Swift Current Broncos tonight; the Raiders travel to Calgary to play the Hitmen. . . .
for our organization and hockey in general.” . . . The Giants meet the Hurricanes in Lethbridge tonight. . . . In Portland, the Winterhawks scored the game’s last three goals and beat the Victoria Royal, 4-2. . . . Portland D Blake Heinrich tied the game 2-2 with his second goal of the season at 6:54 of the second period. . . . Portland F Oliver Bjorkstrand scored his second goal of the game, and 15th of the season, at 19:10 of the second for a 3-2 lead. . . . F Dominic Turgeon added insurance with his seventh oal at 16:54 of the third. . . . Portland F Nic Petan had two assists, while Turgeon also had an assist. . . . Victoria F Greg Chase scored his first goal for the Royals since coming over from the Calgary Hitmen in a trade last week. . . . Portland G Adin Hill stopped 36 shots, including all 16 he faced in the third period. . . . Victoria G Jayden Sittler, making his third straight start, turned aside 32 shots. . . . Portland (12-12-3) has won three in a row. . . . The Royals (14-12-2), who are to face the Chiefs in Spokane tonight, had won their previous two starts. WHL Weekly Report Injuries: #7 Paul Bittner, F, lower body, TBD http://t.co/77KMkXsMZO. The NSA should have the secrecy of WHL injuries.